Los Angeles, CA – VI·ZA is excited to announce the release of the group’s new EP recording, “The Unorthodox Revival: Volume II”. 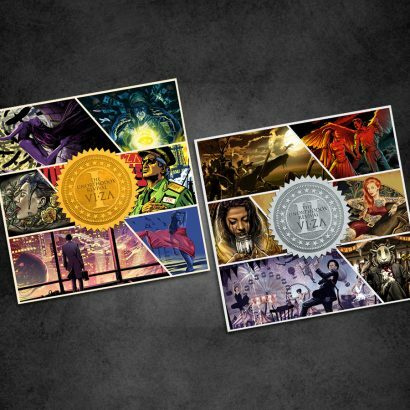 The release will feature hard copy recordings the band’s 6 new songs, which have been released as digital recordings thus far on a monthly basis, in addition to special artwork for fans to enjoy. The 6 songs to be included are “Pinches”, “Sheep”, “Diabolic Angel”, “Dancing Twig”, “Tom Waits for Her” and “Pathway”. “I personally think this is our best work, due in part to the fact each song had its respective time to perfect and our incredible engineer Yury Anisonyan who was on board,” said K’noup. “With such a great reaction to the first EP, we wanted to follow it up and keep the new material flowing,” said Kzirian. “Even though these songs were released digitally on YouTube and Spotify, we want our dedicated fans to be able to enjoy these songs in album form too, and that allows us to incorporate the album artwork physically as well!” he added. “The Unorthodox Revival: Volume II” will be the band’s 4th EP release, joining the self title, “De Facto” and “The Unorthodox Revival: Volume I” recordings, and is the band’s 9th overall hardcopy release. 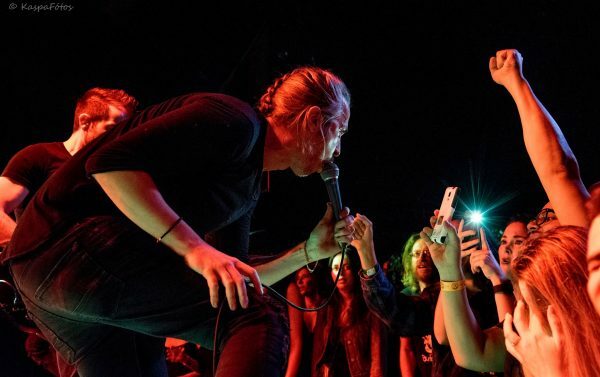 The new EP contains the band’s newest material, which has been written and recorded entirely in 2018, giving fans a feel of the group’s continued growth and exploration of various musical styles and colors. 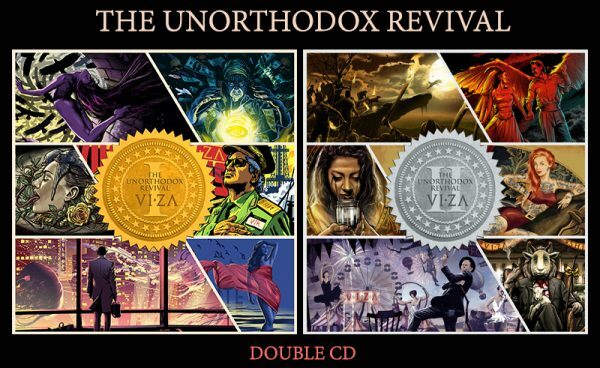 Notably, “The Unorthodox Revival” series of both volumes will feature a series of volumes, all interconnected and representing different but segmented components of VI·ZA’s new music. After returning to the stage in early 2017 the band has been writing and recording actively the past several months, concentrating on composing new material as the band enters a new chapter of its growth. The band is excited to close the book on these first 6 releases, which will compiled as a new EP named “The Unorthodox Revival”. The band then continued to write and record a next batch of 6 tracks, all of which followed the same monthly digital release format. The band recorded with talented recording engineer Yury Anisonyan out of Live Wire Studios in Los Angeles. Anisonyan brings his expertise and unique mixing philosophy to VI·ZA’s sound, creating a unique tapestry of soundscapes. 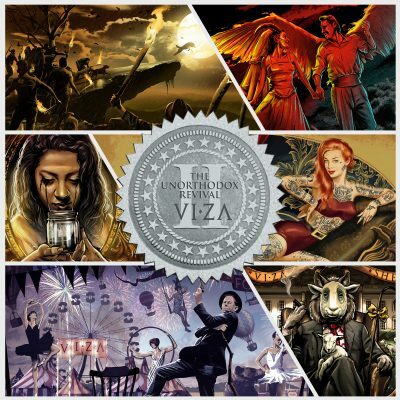 Each new song has been released on VI·ZA’s dedicated YouTube channel at www.youtube.com/user/ExperienceViza. VI·ZA’s new material is an exploration of sounds both old and new, and is sure to pique the interest of both diehard fans and new listeners. 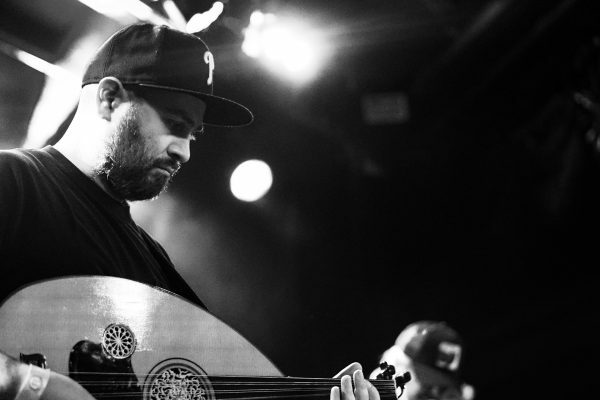 With vocals and a diverse array of instruments like the oud and duduk to combine with guitar, bass and drums, there are some exciting possibilities when it comes to both the core and potential artistic horizon of the band’s sound. 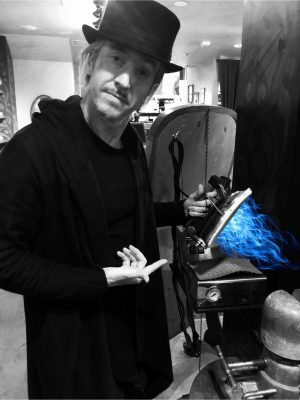 Song titles include “Cash Karma”, “Viktorious”, “A World of Broken Mirrors”, “Aphrodite”, “Velvet Shade”, “Vicious Game”, “Pinches”, “Sheep”, “Diabolic Angel”, “Dancing Twig”, “Tom Waits for Her” and “Pathway”, representing diverse but resonant themes ranging from satire, continuity and social commentary to raw human emotions like love, loss and passion. Whether it’s VI·ZA’s bread and butter energetic style of pulsing percussion with exotic melodies or experimental ideas exploring the spiritual side of their art, the guys promise to keep things interesting with fans coming back for more, especially when it comes to documenting their work in the studio. Keep an eye out for the band on Facebook (www.facebook.com/vizamusic) and Instagram (@vizamusic). 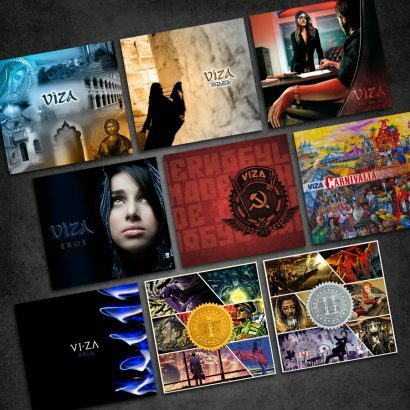 After releasing several albums, performing at major festivals worldwide, joining System of a Down frontman Serj Tankian for two worldwide tours and supporting Gogol Bordello and Skindred, VIZA is looking to explore a new dimension of sound. As a fixture of the Sunset club scene known for energetic and captivating live performances, VIZA is sure to deliver excitement in the form of shows and new songs in 2018. Los Angeles, CA – VI·ZA is excited to announce the release of the group’s tenth new digital song release for 2017-2018. Following the online releases of “Viktorious”, “Cash Karma”, “Velvet Shade”, “A World of Broken Mirrors”, “Aphrodite”, “Vicious Game”, “Pinches”, “Sheep”, “Diabolic Angel”, “Dancing Twig” and “Tom Waits for Her” amidst acclaim and the anticipation of a loyal fan base, “Pathway” has now arrived for listeners to enjoy a stunning audio experience molded in the form of a rock epic. “For our final digital release of the Unorthodox Revival EPs, we wanted to do something special,” said theoudplayer. 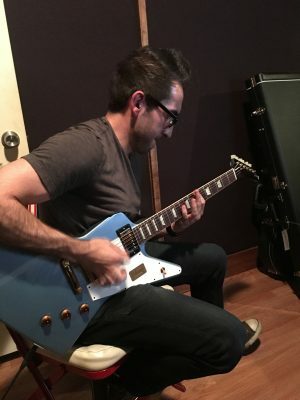 “This song blends some of our traditional time signatures with a rock chorus and the result is quite the hybrid that our fans will really love,” he added. After returning to the stage in early 2017 the band has been writing and recording actively the past several months into 2018, concentrating on composing new material as the band enters a new chapter of its growth. The band was excited to close the book on its first 6 releases, which was compiled as a new EP named “The Unorthodox Revival: Volume I”. VI·ZA then continued to write and record a next batch of 6 tracks, which will populate the second volume of “The Unorthodox Revival” series set for release in November 2018. All songs – such as the recent October 9, 2018 release of “Pathway” – followed the same monthly digital release format. The band recorded with talented recording engineer Yury Anisonyan out of Live Wire Studios in Los Angeles. Anisonyan provided expertise and a unique mixing philosophy to VI·ZA’s sound, creating a unique tapestry of soundscapes. “This was an excellent song written by my bandmate theoudplayer, from melody to harmony to poetry,” said K’noup. VI·ZA’s new material is an exploration of sounds both old and new, and is sure to pique the interest of both diehard fans and new listeners. With soaring vocals and a diverse array of instruments like the oud and duduk to combine with guitar, bass and drums, there are some exciting possibilities when it comes to both the core and potential artistic horizon of the band’s sound. 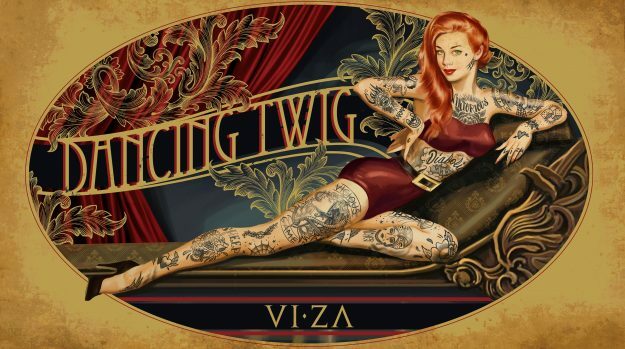 Song titles include “Cash Karma”, “Viktorious”, “A World of Broken Mirrors”, “Aphrodite”, “Velvet Shade” and “Vicious Game”, “Pinches”, “Sheep”, “Diabolic Angel”, “Dancing Twig”, “Tom Waits for Her” and “Pathway”, representing diverse but resonant themes ranging from satire, continuity and social commentary to raw human emotions like love, loss and passion. 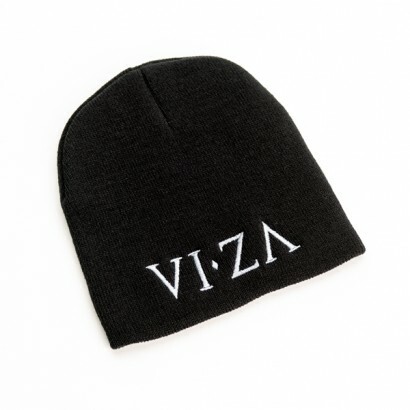 Whether it’s VI·ZA’s bread and butter energetic style of pulsing percussion with exotic melodies or experimental ideas exploring the spiritual side of their art, the guys promise to keep things interesting with fans coming back for more, especially when it comes to documenting their work in the studio. Take a look here, watch it glow. Counting days, we are barricaded. What’s the pathway I don’t know. Can you see the wolf as it stands in between us? Just walk away and tell the people we’re no more. Bare your fangs now, am I crazy? Is she here now? Is it real? I don’t see you, you’re hiding. She is here now, this is real. And as we fall we understand we are at war. Los Angeles, CA – VI·ZA is excited to announce the release of the group’s tenth new digital song release for 2017-2018. 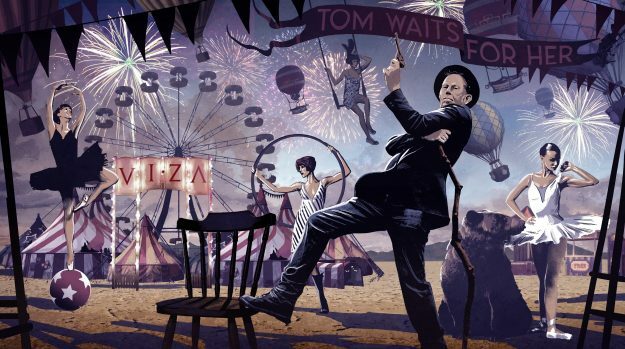 Following the online releases of “Viktorious”, “Cash Karma”, “Velvet Shade”, “A World of Broken Mirrors”, “Aphrodite”, “Vicious Game”, “Pinches”, “Sheep”, “Diabolic Angel”, and “Dancing Twig” amidst acclaim and the anticipation of a loyal fan base, “Tom Waits” has now arrived for listeners to enjoy a charmingly gruff musical adventure. “Why not?” said theoudplayer. “We reached back a bit into our historical DNA and this is what came out, gotta love it!” he added. After returning to the stage in early 2017 the band has been writing and recording actively the past several months, concentrating on composing new material as the band enters a new chapter of its growth. The band is excited to close the book on its first 6 releases, which has been compiled as a new EP named “The Unorthodox Revival: Volume I”. VI·ZA is continuing to write and record a next batch of 6 tracks, which will populate the second volume of “The Unorthodox Revival” series. Subsequent songs – such as the recent May 1, 2018 release of “Dancing Twig” – will follow the same monthly digital release format. The band continues to record with talented recording engineer Yury Anisonyan out of Live Wire Studios in Los Angeles. Anisonyan brings his expertise and unique mixing philosophy to VI·ZA’s sound, creating a unique tapestry of soundscapes. 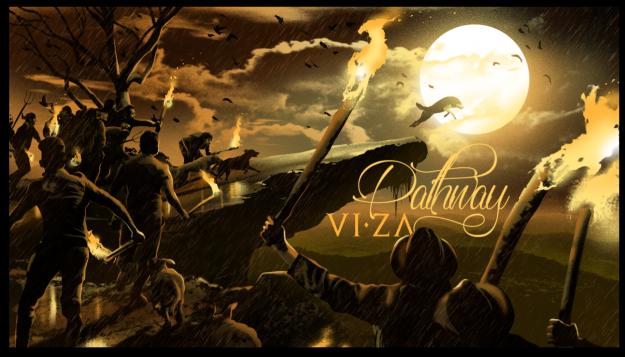 Each new song will be released on VI·ZA’s dedicated YouTube channel at www.youtube.com/user/ExperienceViza. VI·ZA’s new material is an exploration of sounds both old and new, and is sure to pique the interest of both diehard fans and new listeners. With vocals and a diverse array of instruments like the oud and duduk to combine with guitar, bass and drums, there are some exciting possibilities when it comes to both the core and potential artistic horizon of the band’s sound. 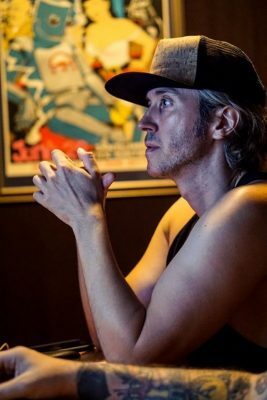 Song titles include “Cash Karma”, “Viktorious”, “A World of Broken Mirrors”, “Aphrodite”, “Velvet Shade” and “Vicious Game”, “Pinches” and “Sheep” among others, representing diverse but resonant themes ranging from satire, continuity and social commentary to raw human emotions like love, loss and passion. Whether it’s VI·ZA’s bread and butter energetic style of pulsing percussion with exotic melodies or experimental ideas exploring the spiritual side of their art, the guys promise to keep things interesting with fans coming back for more, especially when it comes to documenting their work in the studio. 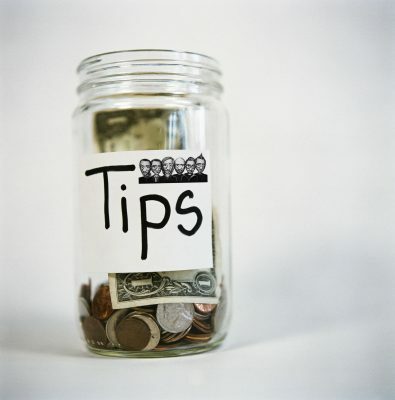 If you enjoy what you hear and want to support our album campaign you can leave us a TIP at our Online Tip Jar….THANK YOU! before she hands you a check. because Tom waits for her. and now she’s left him all alone. Los Angeles, CA – VI·ZA is excited to announce the release of the group’s tenth new digital song release for 2017-2018. Following the online releases of “Viktorious”, “Cash Karma”, “Velvet Shade”, “A World of Broken Mirrors”, “Aphrodite”, “Vicious Game”, “Pinches”, “Sheep” and “Diabolic Angel” amidst acclaim and the anticipation of a loyal fan base, “Dancing Twig” has now arrived for listeners to enjoy a melodic adventure of music and art. 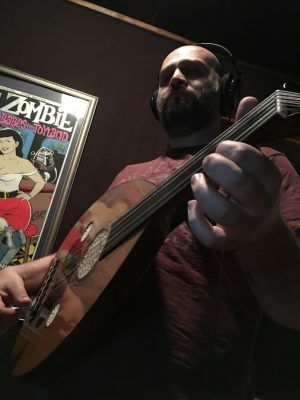 “This song came to me as I wondered about what it would be like to play a melody on my oud with a cartoon of a small dancing twig moving to the music,” said theoudplayer Andrew Kzirian. “The song has an interesting vibe and touches on some of our group’s folky and harmonious sensibilities. It was an exciting journey to put this song together with all the guys – and kudos to K’noup for his excellent as always vocal work collaboration with me,” he added. After returning to the stage in early 2017 the band has been writing and recording actively the past several months, concentrating on composing new material as the band enters a new chapter of its growth. The band is excited to close the book on its first 6 releases, which has been compiled as a new EP named “The Unorthodox Revival: Volume I”. VI·ZA is continuing to write and record a next batch of 6 tracks, which will populate the second volume of “The Unorthodox Revival” series. Subsequent songs – such as the recent April 1, 2018 release of “Diabolic Angel” – will follow the same monthly digital release format. The band continues to record with talented recording engineer Yury Anisonyan out of Live Wire Studios in Los Angeles. Anisonyan brings his expertise and unique mixing philosophy to VI·ZA’s sound, creating a unique tapestry of soundscapes. VI·ZA’s new material is an exploration of sounds both old and new, and is sure to pique the interest of both diehard fans and new listeners. With vocals and a diverse array of instruments like the oud and duduk to combine with guitar, bass and drums, there are some exciting possibilities when it comes to both the core and potential artistic horizon of the band’s sound. Song titles include “Cash Karma”, “Viktorious”, “A World of Broken Mirrors”, “Aphrodite”, “Velvet Shade” and “Vicious Game”, “Pinches” and “Sheep” representing diverse but resonant themes ranging from satire, continuity and social commentary to raw human emotions like love, loss and passion. Whether it’s VI·ZA’s bread and butter energetic style of pulsing percussion with exotic melodies or experimental ideas exploring the spiritual side of their art, the guys promise to keep things interesting with fans coming back for more, especially when it comes to documenting their work in the studio. A dancing twig is before me. Narrow eyes but it sees right into my soul. Dancing twig won’t you show me. You’ve come around and you won’t let me let go. Dancing twig are you crazy? All those thorns so you cut me la la la. I’ve gotta ask do you love me. You’ve turned around and left me here alone. Staring into the sky you’re all I want. Dancing twig won’t you love me? Thinking how I can ask this of you. Write me a song and we’ll sing. Show me the gold I’m your king. Put out my hand kiss this ring . You are the yang to my yang. Dancing twig what’s the story? You’ve worked me up and I don’t know what to do. Dancing twig you’re so lonely. And it’s time to unplug this show for good. Los Angeles, CA– VI·ZA is pleased to announce that it will be joining a star studded lineup of some of the most compelling rock bands for this year’s Aftershock Festival, set to take place on the weekend of October 13-14, 2018 at Discovery Park in Northern California. Sharing the stage alongside System of a Down, Deftones, Alice in Chains, Incubus, Godsmack, 311, and several other talented acts, VI·ZA is excited to return to Aftershock after first appearing at the growing and vibrant festival in 2014 with Limp Bizkit, Rob Zombie, Five Finger Death Punch, Weezer, AWOLNATION, The Offspring, Butcher Babies and scores of others. “I am totally flabbergasted to be back and part of this tremendous lineup. I might just do something unexpected,” said K’noup. “It’s fitting that we return to the scene of the crime to rejoin the Aftershock team – it feels great to be back,” said theoudplayer. “Now I can dingle super hard for festival goers with my fancy new pedals,” he added. Aftershock is one of the premier music festivals in North America, featuring the many of the marquee acts in rock and metal. 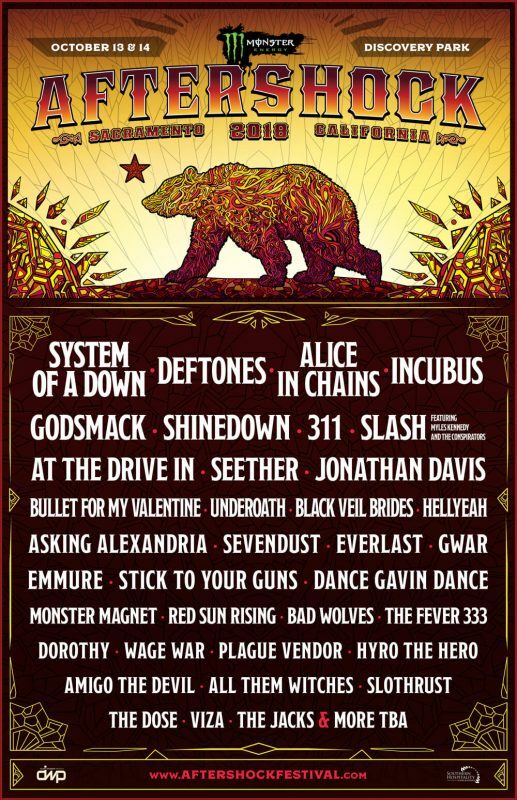 Beginning in 2012 as a single day event, Aftershock has expanded to a two day weekend festival incorporating more bands and a festive atmosphere with attendees coming from all over the world. After returning to the stage in early 2017 VI·ZA has been writing and recording actively the past several months, concentrating on composing new material as the band enters a new chapter of its growth. The band is excited to close the book on these first 6 releases, which has been compiled as a new EP named “The Unorthodox Revival: Volume I”. VI·ZA is continuing to write and record a next batch of 6 tracks, which will populate the second volume of “The Unorthodox Revival” series. Subsequent songs will follow the same monthly digital release format. The band continues to record with talented recording engineer Yury Anisonyan out of Live Wire Studios in Los Angeles. Anisonyan brings his expertise and unique mixing philosophy to VI·ZA’s sound, creating a unique tapestry of soundscapes. Los Angeles, CA – VI·ZA is excited to announce the release of the group’s ninth new digital song release for 2017-2018. Following the online releases of “Viktorious”, “Cash Karma”, “Velvet Shade”, “A World of Broken Mirrors”, “Aphrodite”, “Vicious Game”, “Pinches” and “Sheep” amidst acclaim and the anticipation of a loyal fan base, “Diabolic Angel” has now arrived for listeners to enjoy a melodic adventure of music and art. 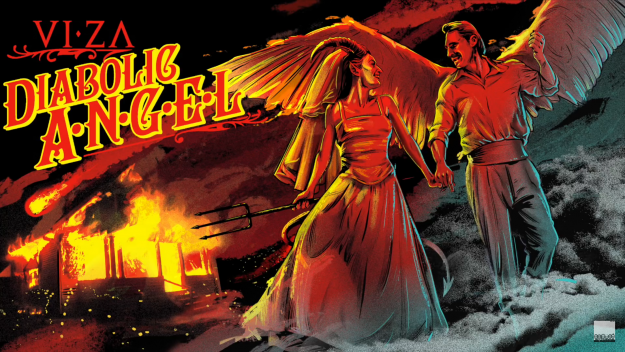 “Diabolic Angel is a song I wrote about a film director (played by an angel) who fell in love with his starlet (played by a demon) on the set of his Armageddon cinema DIABOLIC ANGEL. It plays along the whole belief that opposites do attract, and at the time of writing I was listening to Type O Negative, so I guess that’s where the whole dark 60’s swing motif came from”, said K’noup. “This song does a great job incorporating some of our inherent Middle Eastern musical influences with our rock sensibilities”, said Kzirian. “Had fun experimenting with different accents and funky time patterns on the oud,” he added. After returning to the stage in early 2017 the band has been writing and recording actively the past several months, concentrating on composing new material as the band enters a new chapter of its growth. The band is excited to close the book on these first 6 releases, which has been compiled as a new EP named “The Unorthodox Revival: Volume I”. VI·ZA is continuing to write and record a next batch of 6 tracks, which will populate the second volume of “The Unorthodox Revival” series. Subsequent songs – such as the March 1, 2018 release of “Sheep” and this month’s “Diabolic Angel” release – will follow the same monthly digital release format. The band continues to record with talented recording engineer Yury Anisonyan out of Live Wire Studios in Los Angeles. Anisonyan brings his expertise and unique mixing philosophy to VI·ZA’s sound, creating a unique tapestry of soundscapes. VI·ZA’s new materialis an exploration of sounds both old and new, and is sure to pique the interest of both diehard fans and new listeners. 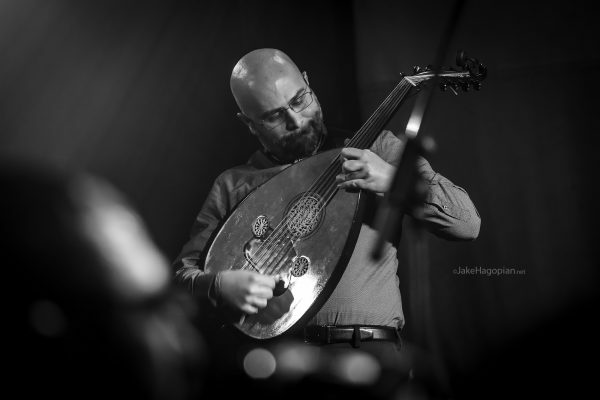 With vocals and a diverse array of instruments like the oud and duduk to combine with guitar, bass and drums, there are some exciting possibilities when it comes to both the core and potential artistic horizon of the band’s sound. Song titles include “Cash Karma”, “Viktorious”, “A World of Broken Mirrors”, “Aphrodite”, “Velvet Shade” and “Vicious Game”, “Pinches” and “Sheep” representing diverse but resonant themes ranging from satire, continuity and social commentary to raw human emotions like love, loss and passion. Whether it’s VI·ZA’s bread and butter energetic style of pulsing percussion with exotic melodies or experimental ideas exploring the spiritual side of their art, the guys promise to keep things interesting with fans coming back for more, especially when it comes to documenting their work in the studio. After releasing several albums, performing at major festivals worldwide, joining System of a Down frontmanSerjTankian for two worldwide tours and supporting Gogol Bordello and Skindred, VIZA is looking to explore a new dimension of sound. As a fixture of the Sunset club scene known for energetic and captivating live performances, VIZA is sure to deliver excitement in the form of shows and new songs in 2018. I can see the sun in your eyes as your face turns cold as ice. I can feel the heat down my cheek as the panic starts to creep. I will be the one who takes it all from you. I will be the one who walks in your shoes. Diabolic Angel dancing through the night. Diabolic Angel a requiem for his wife. I will bring the world to its knees and crown you queen of disease. I will build a door that meets the sky so we can vanish from the light. I will be the way I always was for you. I will be the face you never knew.